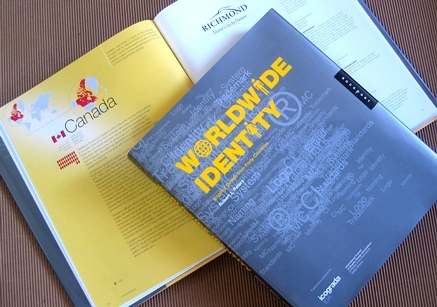 Worldwide Identity showcases identity projects from around the world, compiled in association with the International Council of Graphic Design Associations (Icograda). The book includes a contextual essay about each of the 40 countries from which works are drawn, along with information including maps, flags, and comparative metrics such as national population, area, languages, and GDP per capita. It also includes directories of Icograda member associations around the globe, and all contributors. Robert L. Peters is the founding principal of Circle, an international visual communications consultancy based in Winnipeg, Canada. He was president of Icograda from 2001-2003, and is active internationally as a consultant and design strategist, writer, policy advisor, juror, and guest lecturer. ISBN: 1-59253-187-3, Rockport Publishers, Inc.
Hardcover, 256 pages, 400 color images. Read book reviews at Amazon. Read the ‘Identity Matters’ editorial (as a PDF, 792 K) from the Opinion/Commentary article originally published in the July 2005 issue of Communication Arts magazine [CA #337, Illustration Annual 46]).